Thanks again: More great blogs!! Lilly Pulitzer STEALS and DEALS! Look what I picked up this week! My loss is your (Toss) gain! Lilly Oh Shift ornaments on SALE! 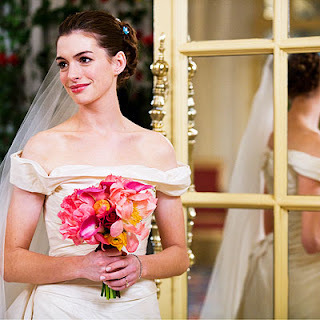 InStyle has a lookbook for Bride Wars. I loved the fashion in the movie! Emma's dress was supposed to be "vintage," from her mother. Did you know it was designed by Vera Wang too? And did the totes not make you want to run out and buy one like RIGHT NOW. I'm pretty sure Emma's was Coach and I want to say that Liv's was Marc Jacobs I think. I love Vera's wedding dresses! I LOVE ribbons on wedding dresses. My friend got married and wore a white dress (obv) and had a creamish-light brownish color ribbon, and it was beautiful! I'm so excited you posted this. I ADORED the fashion! Left you something on my blog! I so want the Burberry coat! Yes, I must admit, the clothes in that movie were excellent. I was quite the fan. I just saw BW on Thursday with some girlfriends and LOVED it! You are right the fashions rock! I didn't know that the "vintage" dress was VW too. I loved them both; but I would--my wedding dress was VW too! I loved Emma's wedding dress. I thought it looked beautiful with her pale skin. I like the bow on Liv's wedding dress too! Very Cute. I loved the movie too!! Also, the dresses and outfits were great. I can't quite bring myself to see the movie, but I fiercely love that green trench on Anne Hathaway. Swoon! Such a great movie!! Love the post! Emma's dress definitely didn't look vintage, but I loveeeeed it! I wasn't completely into the uneven straps but it was gorgeous! LOVED this movie! The clothes were so cute! I loved the green Vera Wang Lavender coat and pretty much most of Emma's outfits! I love movies with a fabulous fashion sense, ha! I love the coats - anytime you throw Burberry into the mix I'm in. And the wedding dresses - gorgeous! Yes yes yes! Totally agree with you on this. I have to go edit my post now. Haha. great movie ... great fashion! I loved the fashion as well. The green coat that Emma wore was perfect. I also like the bags/totes that they carried. I really love the outfits!!! How cool, I will have to check this out. I just loved the movie, too funny! How could Emma afford designer clothing on a teacher's salary? Ah, movie magic! I just tagged you! Check out my blog when you get a chance. Oh, I'm dying to watch it just for the clothes!!! Anne Hathaway came to our inauguration party.